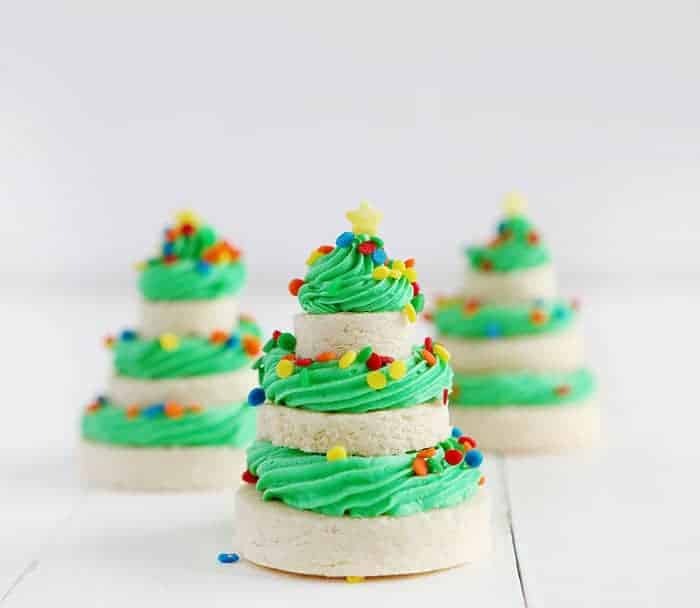 Matching up the perfect sugar cookie recipe with the perfect buttercream recipe gets you an AMAZING Christmas Tree Cookie’s recipe! 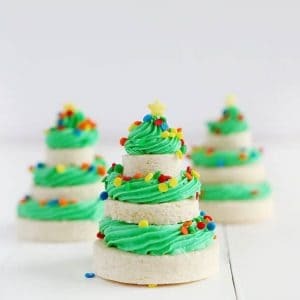 I saw these Christmas Cookies over on Delish and knew I had to make them! I made a couple small changes to ensure they would be perfect for everyone. I have a big list of amazing Christmas Cookies right here, including my award-winning Cut Out Sugar Cookie Recipe! The first change was the size. When I originally made the cookies according to the instructions they were far too big to handle, much less eat! I made the largest cookie layer of the cookie tree only 3-inches big. The other change was the recipe. I used an easy, no chilling, delicious sugar cookie dough that made the process much quicker. I love how these turned out and thank you to Delish for the fun idea! PRO TIP: If you can’t find mini stars, you can pipe out stars with yellow buttercream and freeze before adding to cookies! Begin by rolling out cookie dough. Prepare three cookie sheets each lined with parchment paper. 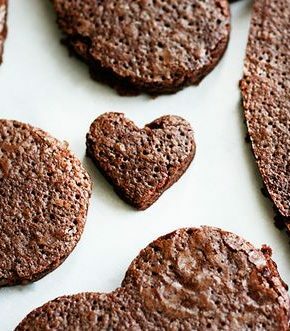 Start cutting out cookies with the 2-inch cookie cutter and set on the pan at least an inch apart. (these cookies should not spread too much) Fill the pan. Now, using the 1 1/2 inch cookie cutter, cut out the same amount of cookies you did with the 2-inch. (So if you made fifteen 2-inch cookies you will want fifteen 1 1/2-inch cookies and fifteen 1-inch cookies) Repeat with the 1-inch cookie cutter. Repeat this process with any remaining sugar cookie dough. 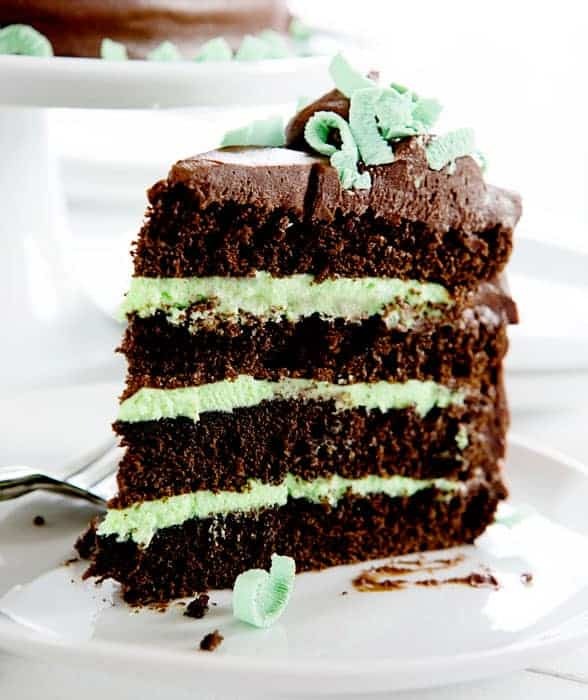 Prepare buttercream and tint with green food coloring. You can make the color as light or as deep as you prefer. 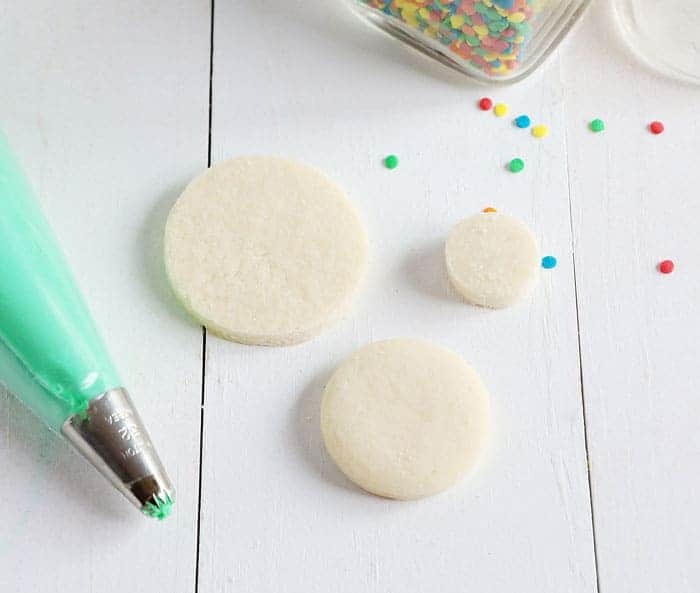 Fill a pastry bag fitted with a #32 decorating tip and green buttercream. When cookies are cooled you can begin piping. Take the largest shape and set on a solid surface. Pipe a ring around the outside with the #32 tip and then fill in the center. 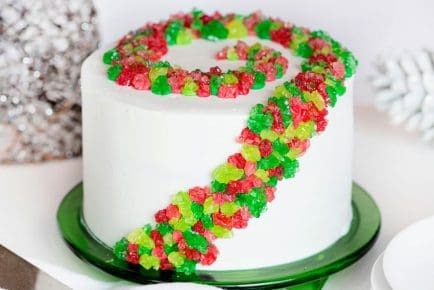 Set the next smallest size (1 1/2-inch cookie) on top and pipe around, then fill in the center. Place the final 1-inch cookie on top and pipe out a small dollop on top. Finally, place the star on top. Repeat for remaining cookies. For a couple of the cookies that spread (the ones that I baked after I had re-rolled the dough a couple times! ), I used the cookie cutter on the cookies right out of the oven. Meaning, I set the hot cookies on the counter, pressed the cookie cutter onto any cookie that had slightly spread, then carefully removed the excess. This helped ensure that all my cookies were the same size and shape. Do these cookies work well for a cookie exchange? YES! Speaking from experience, not only do they work well but people LOVE them. They are small enough that you can fit 12 on a platter and because I used a traditional American buttercream that crusts, they are quite sturdy. Variations could be using a chocolate sugar cookie recipe and a darker tint of buttercream, then sprinkle with powdered sugar. For the chocolate sugar cookies, I used this Triple Chocolate Sugar Cookies recipe but omitted the white chocolate. 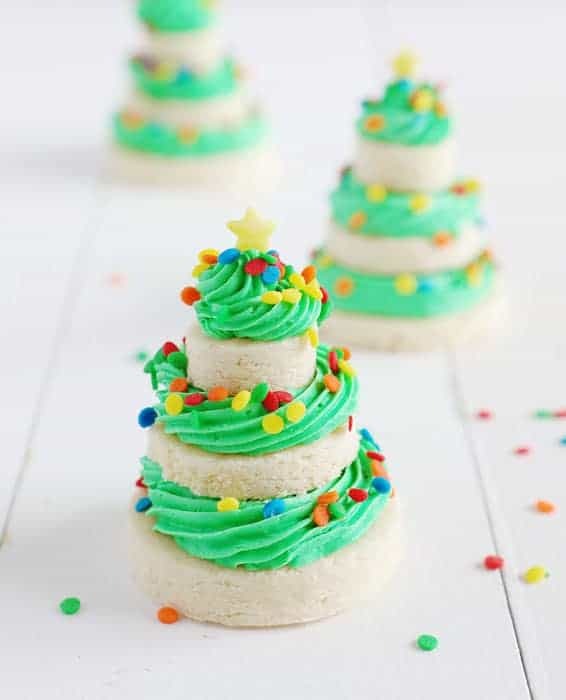 Matching up the perfect sugar cookie recipe with the perfect buttercream recipe gets you an AMAZING Christmas Tree Cookie’s recipe! 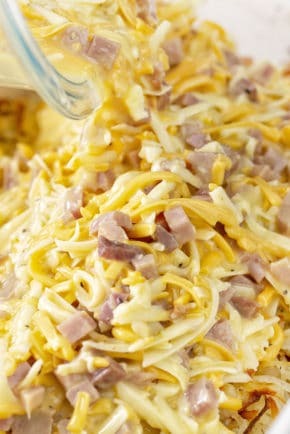 With the mixer on low, slowly add in confectioners sugar, milk, green food color, and salt; frequently scrape sides and bottom of the bowl. 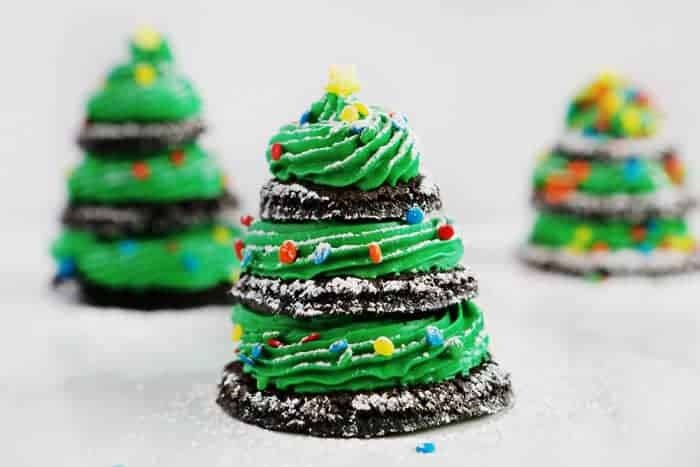 Check out these other fun Christmas Cookie recipes! These are so cute! Do the different cookie sizes bake for different times, or will the small cookies be over-baked by the time the bigger cookies are done? 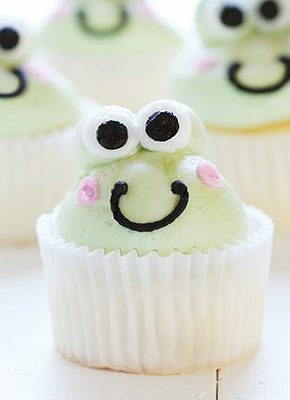 I love how cute these are! I think I’ll make them using a GF cookie dough. So lovely and creative yet simple ! Thank you ! Cellophane bag is great idea. 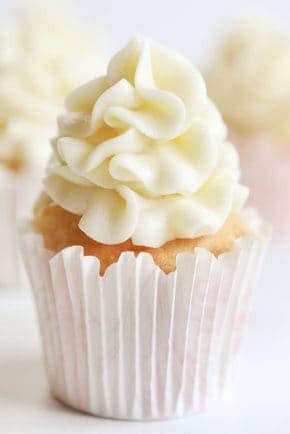 Is the frosting harden? Will it smear in the bag? Hi Amanda. Will the frosting harden? Would it smear in the bag? Thanks! The frosting does harden enough to gently stack. It does not smear, but if you pressed into the frosting it would smudge.